After decades of negotiations, an agreement has been reached to settle the long-standing Lubicon Lake Band land claim as well as treaty benefits for members. Minister Bennett, Premier Notley, Minister Feehan, Chief Laboucan and Council members celebrate historic land claim settlement. The Lubicon Lake Band, the Government of Alberta and the Government of Canada signed the treaty benefits and land claim agreements after members of the community voted overwhelmingly in favour of the settlement. The agreement includes a land allocation of more than 246 square kilometres (95 square miles) for the Lubicon Lake Band, as well as $95 million in financial compensation from Canada. In addition, Alberta is providing $18 million. The agreement will also include infrastructure such as roads, housing, utility services, internet and a school. 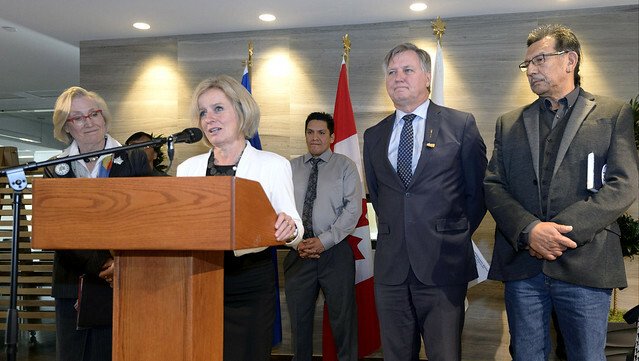 This historic agreement will address a decades-long land claim and will contribute to improving the quality of life for members of the Lubicon Lake Band. The settlement was approved by Lubicon Lake Band members in a community vote that took place between Sept. 14 and Oct. 15, 2018. This is a historic occasion for the members of the Lubicon Lake Band, for Alberta and for all of Canada. With this settlement, the Lubicon Lake Band will finally receive the lands and treaty benefits to which they are entitled under Treaty 8.